of the femur,specifically,the Intertrochanteric and Subtrochanteric regions,thereby combining many of the features of an intramedullary nail and hip screw system. The implant supports the anatomic reduction and internal fixation of the femoral head and neck and provides anti-rotational stability for many difficult fracture situations. The ITST Intramedullary Nail System features a sliding or non-sliding Lag Screw,to help allow for neck fracture settlement,while preventing fragment impaction. 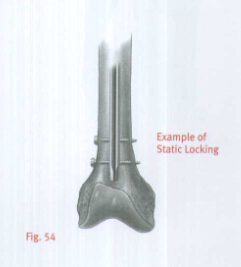 System includes options for dynamic and static distal locking. Manufactured from high strength stainless steel alloy(22-13-5),the ITST intramedullary nail implants are available in a wide range of diameters,as well as short and long lengths to accommodate total joint prostheses. Most femoral neck-shaft angles measure 130˚.The ITST Lag Screw was designed to mimic this angle for use in the majority of patients.In cases where appropriate, a 6.5mm Anti-Rotation Screw is available for use in combination with the 11mm Lag Screw to help stabilize fracture fragments. WARNING:The surgeon should beaware that the use of the system in osteoporotic bone, nonanatomic reductions, or improper placement of the nail-screw construct could increase the risk of failure or cut out of the implant. The implant is contraindicated for use in medial neck fractures. This implant may not provide the required/desired stability when used to treat some femoral neck fractures types. Use of this device is contraindicated in patients with active infection at sites such as the genitourinary tract, pulmonary system,skin, or other sites because hematogenous spread may occur. The foci of infection must be treated and the infection resolved prior to surgery. Routine prophylactic antibiotic treatment immediately before, during, and after surgery may be especially useful for these patients. 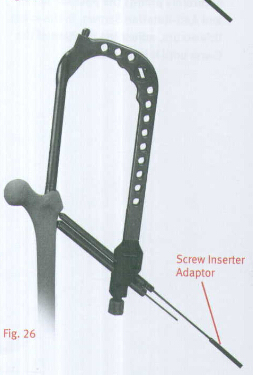 The ITST Femoral Fixation System implants are designed to place the Lag Screw at 130˚,with15˚ of anteversion on the long nails, to accommodate the most common anatomic femoral neck angle,while minimizing inventory requirements.A/P and lateral C-arm images should be obtained prior to the surgical procedure. NOTE:The suitability of this implant for the patient should be determined by templating prior to surgery using X-rays of the affected femur. An A/P preoperative X-ray should be taken of the contralateral hip or of the affected limb once an anatomic reduction has been achieved. X-rays taken at a 36-inch distance from the source result in 10-15 percent magnification of the bone .An Ossimeter,which takes this magnification into account, should be used to help determine the actual nail length and diameter to be used. The angle of the intersection of the femoral shaft axis and femoral neck axis should be observed. The ITST Templates reflect a 15 percent magnification of actual size. The patient may be placed in either the supine (free legged or traction)or lateral (traction) position. arm should be placed above the chest on an arm holder or on a pillow with stockinet. 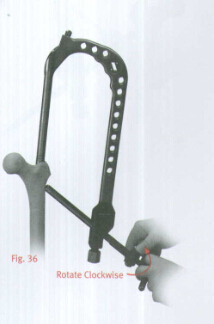 This upper extremity placement improves starting point entry and unencumbered implant insertion. TABLE - Place the patient supine on the fracture table (Fig.2).Pad all areas of potential pressure. Flex and abduct the non-injured leg onto a well padded leg holder .Or , place the non-injured leg into a scissor type position. Position the buttock of the injured leg as close to the edge of the table as possible.Some tables will allow for an eccentric peroneal post connection to the table. Make sure the peroneal post is padded and wide in order to dissipate the pressure on the groin area. Place the injured leg into skeletal traction (distal femoral or proximal tibial)or boot-traction.The ipsilateral arm should be placed above the chest on an arm holder or on a pillow with stockinet. TABLE-Use the radiolucent table with a radiolucent peroneal post. Place the traction boots on the patient during anesthesia induction. Turn the patient in a lateral position,with the operative leg over the over the top of the peroneal post. Attach the boots to the table with straight traction applied through the boots. If heavy traction is necessary, a pin is placed in the distal femur and the knee is flexed, applying traction through the pin.Flex and adduct the operative leg. Straighten the non-operative leg in line with the body. Rotate the patella slightly inwards towards the floor, to help prevent an external rotation deformity. Bring the C-arm in perpendicular to the long axis of the femur. When moving proximally and distally, the entire C-arm is moved, to stay perpendicular to the long axis,To visualize the proximal femur and the head, rotate the C-arm 15˚ over the top and tilted 45˚cephalad. Patient Positioning for Standard Technique The patient should be placed in either the supine or lateral decubitus position on the table. The sacral rest and perineal post should be well padded. In multiple trauma patients,the supine position may be used for easier access to the patient's airway, as well as to facilitate the treatment of other injuries. The supine position also facilitates fracture reduction and rotational alignment of the femur. It is critical to reduce the fracture before beginning the surgical procedure. An anatomic reduction or a slight valgus reduction of the femoral head and neck,should be seen in the A/P film.Occasionally, a slight sag of the fracture may be seen on the lateral view. This should be taken into consideration during the surgical procedure. Occasionally, flexion of the injured limb will facilitate sagittal reduction. As a rule of thumb, intertrochanteric fractures are locked into position with internal rotation of the leg. The patella should point towards the ceiling. For Pertrochanteric or Subtrochaneric fractures(especially with involvement of the lesser trochanter)the fracture is reduced with the leg in external rotation. Oblique roll over or roll back fluoroscopic views can assist visualization of proper rotation. This is most important when considering the starting point of the Steinman pins or the steinman pins or cannulated awlinto the femur. NOTE: It is essential to obtain excellent A/P and lateral images of the femoral head and neck prior to beginning the surgery regardless of which patient position is used. The use of image intensification or other x-ray imaging is required. The image intensifier should be sterile-draped and may be positioned form the contralateral or ipsilateral side of the operating table. Confirm visualization of the hip as well as the shaft of the femur using image intensification before prepping and draping. 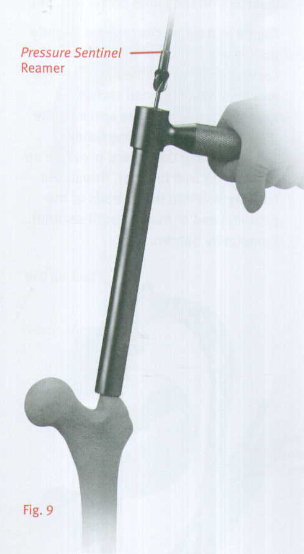 Bend the patient's torso away from the affected extremity to improve access to the greater trochanter. If access to the greater trochanter is still inadequate,adduct the affected leg. However, to achieve proper alignment of the fracture, this adducted position must be corrected prior to insertion of the nail. The prep includes the ipsilateral axilla, trunk,buttock, hip, thigh(circumferentially),and knee. The drape should extend up to the axilla with U-shaped drapes. The free trunk and buttock skin improves nail insertion and diminishes guide entrapment on the drapes. Furthermore,the free area increases the freedom for percutaneous insertion and incision closure. The drape should extend past the knee to allow for distal interlock insertion. Prep and drape similar to the MIS technique, although it is only necessary to drape proximally to the distal portion of the thoracic cavity for the standard technique, not all the way to the axilla. If the patient is obese, Prep and drape to the axilla and use a more proximal entry point. An attempt at fracture site reduction should be performed initially to facilitate the starting site placement, central reaming, and nail-screw insertion, The rotation and alignment should have been performed before the prep and drape. In fractures with varus alignment despite traction, placement of the patient in a lateral position of the percutaneous reduction instruments can help assist the reduction. A spike pusher or tenaculum clamp can be inserted through a 25 to 30mm incision to realign the a 25 to 30mm incision to realign the proximal fragment. The classic flexion, abduction, and external rotation of the proximal fragment requires reduction at this the time.A spike pusher or tenaculum clamp in an anterior to posterior direction will help accomplish the reduction. Palpate the line of the femur starting at the greater trochanter. Continue this line of insertion proximally until reaching the level approximating the iliac crest (more proximal with obese patients) (Fig.3). Using a sterile marking pen, mark the line of intersection between these two lines; this corresponds to the insertion site. Insert the 3.2mm terminally threaded Steinman pin through the soft tissues.The correct atarting point on the Ap view is the medial half of the greater trochanter. The correct starting point on the lateral view corresponds to the central half of the femoral neck. An optional cannula can also be used to help guide the pin into the correct position. The cannula is inserted through a 25mm incision at the levet of the iliac crest. The cannula can also be used to protect tissues while reaming. Use a # 15 blade to create an incision centered around the Steinman pin. The incision needs to be only 15mm-20mm in length. Begin the skin incision 1cm proximal to the tip of the greater trochanter, and extend it proximally for about 5cm in a longitudinal direction. Continue the incision down through the subcutaneous tissues and split the fascia lata. 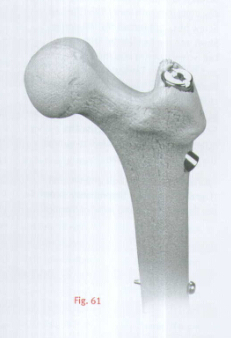 Insert the terminally threaded Steinman pin through the greater trochanter down to the level of the lesser trochanter(about 8cm). Ream using the 8mm trochanteric reamer (for comminuted fracture lines extending into or around the insertion site)followed by the 17mm trochanteric reamer (initially for fractures without fracture lines extending into the starting site)followed by the 17mm trochanteric reamer (initially for fractures without fracture lines extending into the starting site). 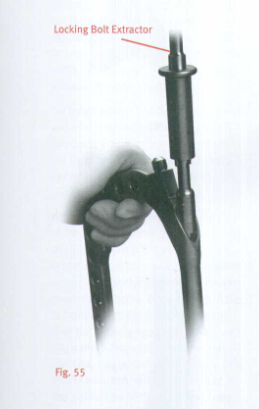 The reamers can be inserted freely through the soft tissues or through the cannula. The entry portal should be in line with the planned nail insertion and should line up with the femoral canal on the AP and lateral views (not aiming to the medial or anterior cortices). 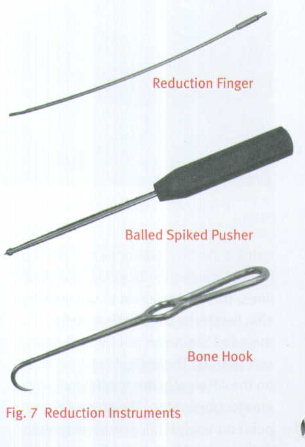 A cannulated awl can be used instead of a guide wire to create the entry portal. Place the tip of the awl in the selected starting point (tonfirm using bi-planer fluoroscopy).Advance the awl through the greater trochanter into the canal in line with the planned nail insertion (Fig.4). On the back table, attach the 3.0mm Bulb-tipped Guide Wire to the Wire Grip T-Handle,and tighten(Fig.5). The tip of the Guide Wire may be bent to approximately 20˚,to facilitate passage across the fracture site or into the central aspect of the distal femur. 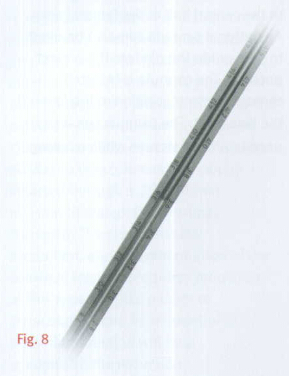 NOTE:If using a cannulated awl, the 3.0mm Bulb-Tipped Guide Wire may be passed directly through the cannulated awl without the 45˚bend(Fig.6). Insert the Guide Wire through the entry hole and manipulate it down the proximal femur across the fracture site. At the fracture site, manipulate the Guide Wire under C-arm control across the fracture site . If reduction of the abducted and flexed hip is difficult, place pressure on the proximal fragment, either with the hand or directly with a reduction rod or other instrument. 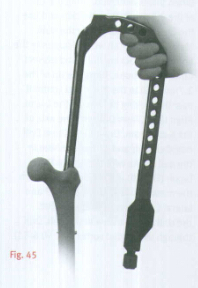 An alternative technique is to reduce the fracture using the Reduction Instruments shown in Figure 7 . 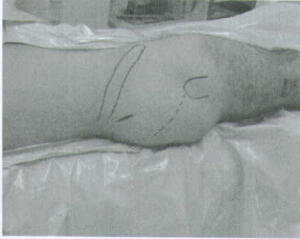 The reduction finger can also be used to assist in reduction if the surgeon creates an initial oblique starting portal. Once in the distal canal, pass the wire to the distal epiphyseal scar. Gently tap the guide wire into the dense distal bone, so that the wire will not retract with reamer removal. The surgeon determines the proper nail length using the Nail Length Gauge. 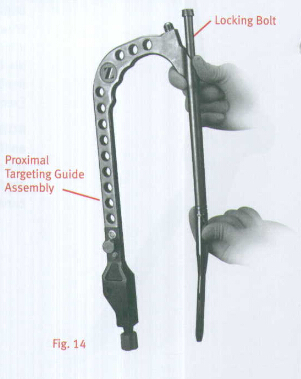 Slide the gauge over the guide wire until the tip rests along the proximal aspect of the greater trochanter(Fig.8). The ITST MIS Cannula can be inserted into the incision to protect the soft tissue while reaming. Thread the Centering Bushing into the Cannula and place the Cannula firmly against the bone. Remove Centering Bushing. Ream the femoral canal sequentially in 0.5mm increments using the Long Pressure Sentinel®Intramedullary Reaming System(Fig.9).Ream until cortical chatter is experienced. Based on bone quality and curvature of radius, nail diameter is 1-22mm less than the last reamer used. Over-reaming the canal by one or two millimeters may facilitate preparation of the bone to accommodate the implant. The trochanteric region should be reamed to 17mm using the Trochanteric Reamer for all patients to accommodate the implant and avoid separation or widening of known or unknown fracture lines(Fig.10).Use caution in advancing the Taper Reamer. An alternative to sequentially ream with a Pressure Sentinel Intramedullary Reamer to 17mm diameter. Ream to the level of the lesser trochanter(or about 8cm depth), to accommodate the implant by advancing the Taper reamer into the proximal canal opening until the reamer flutes are sunk to the level of the lesser trochanter(Fig.11).Confirm position using the C-arm. Replace the Bulb-Tipped Guide wire with the Smooth Guide Wire through the Exchange Tube. 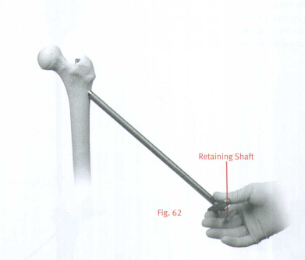 NOTE: Reaming amounts will depend on the quality of the bone present, the minimum diameter of the femoral shaft, and the amount of femoral curvature present. 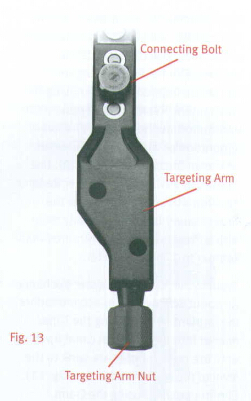 Attach the blue Modular Targeting Arm to the Barrel using the Connecting Bolt.Tighten the Connecting Bolt by hand(Fig.12).Twist the Targeting Arm Nut on to the end of the Blue Targeting Guide in preparation for lag screw insertion(Fig.13).The Nut should not be tightened at this point. 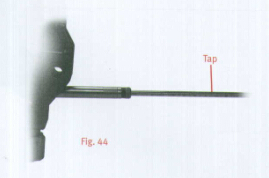 Slide the ITST Locking Bolt through the barrel (Fig.14). Approximate the nail to the external "keys"on the barrel. NOTE: The Guide is universal and it is critical that the nail be properly aligned with the Guide for a Left or Right implant. 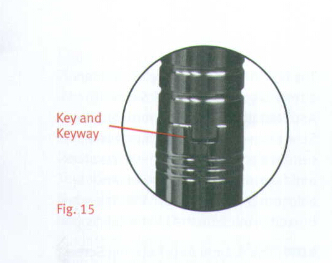 Line up the keys of the Guide with the keyways of the nail so that they fit snugly(Fig.15). Toggle and rotate the Inserter slightly until it seats into the teeth of the Locking Bolt. The etched arrow at the proximal rim of the nail should be exactly aligned with the arrow on the distal rim of the Targeting Guide (Fig.17).Using downward pressure on the Locking Bolt Inserter, thread the Locking Bolt into the threads of the proximal end of the nail until secured. Completely tighten. NOTE: Prior to inserting the implant, insert the two sets of Drill and Screw Bushings into the appropriate holes in the targeting Guide. 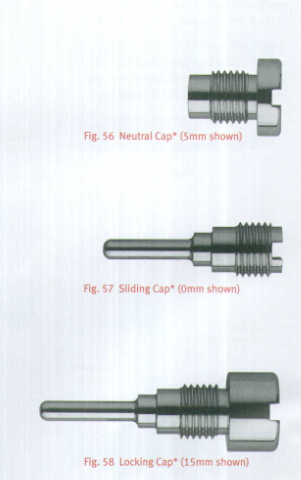 Slide a drill or guide pin through the Bushings, and through the screw holes in the implant to assess correct instrument assembly (Fig.18). Monitor the progression of the nail down the canal using a C-arm. A percutaneous 3.2mm Threaded Guide Pin may be placed along the anterior axis of the femoral neck paralleling the femoral neck on the AP and lateral views to mark the correct anteversion. Align the Targeting Guide parallel(on the lateral view)to the percutaneous pin to assure that accurate implant anteversion has been achieved. Check the final position of the implant using C-arm. If the nail fails to progress easily down the canal, remove it, and use a smaller nail, or over-ream the canal in 0.5mm increments untiy the implant passes more easily down the femoral canal. The surgeon should also check the status of the nail in the distal femur. If the nail is too long, a shorter nail should be used to avoid distal femoral cortical or articular penetration.If the curvature of the femur does not accommodate the nail, using a shorter or smaller nail will assist nail placement. NOTE: If nail insertion can not be achieved by hand, thread the Small or Long Threaded Driver on the Barrel (Fig.19).Insert the nail into the canal using a series of gentle impactions, if necessary, on the Threaded Driver until the nail is seated at the desired depth. The ITST Nail accommodates both an 11mm Lag Screw and a 6.5mm Anti-Rotation Screw. 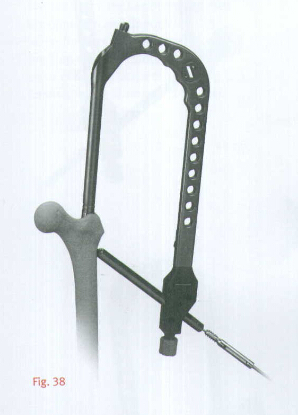 The Anti-Rotation Screw may be utilized in the case of certain fractures, where the bone stock and femoral neck/head bone stock is able to accommodate it. If only one screw is used, it must be the 11mm Lag Screw. neck is able to accommodate it; however, it should not be used if there is any concern that the femoral head or neck neck bone will not accommodate it. WARNING: Failure to appropriately consider femoral head/neck bone mass and quality could result in implant cut-out. Remember the goal of lag screw placement is perfect placement into the central position of the femoral head on the AP and lateral view. Pin into the Anteversion Verification Hole in the barrel(Fig.21). Verify under C-arm that the Guide Pin appears in the center of the femoral neck in a superior/lateral view. This will help prevent any parallax error. 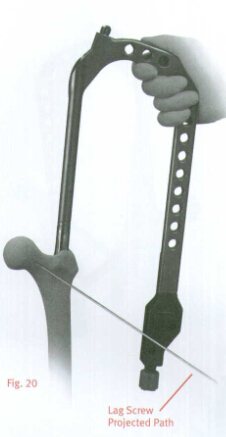 The outer aspect of the windowed arm of the Outrigger,which lies directly over the femoral neck, represents the superior and inferior position of the Lag and Anti-Rotation Screws(Fig.22). If the nail anteversion requires adjustment, move the nail up or down in the canal by hand or by gently impacting the Threaded Driver until the position of the nail with the C-arm. Adjusting nail depth may be useful in accommodating various femoral neck anatomies. NOTE: If the C-arm is off axis, the alignment of the Outrigger may not accurately predict the position of Lag and Anti-Rotation Screws. In the event this occurs, adjust the position of the C-arm until it is on axis. Nail may be inserted by hand, If insertion can not be achieved by hand, please see note on page 10.Insert nail (assembled with targeting guide)into the femoral canal. NOTE: The 6.5mm Anti-Rotation Screw may be used to enhance fracture stability if the femoral neck is able to accommodate it. Remove the 3.2mm Guide Wire. Assemble the Lag Screw Pin Bushing and Lag Screw Bushing together and place the assembly into the inferior screw hole in the Targeting Arm (Fig.23).Assemble the 3.2mm Arm Pin Bushing, the 5.0mm Drill Bushing and the 8.0mm Screw Bushing and insert the assembly into the superior screw hole in the Targeting Arm(Fig.24). When both bushings are inserted, the 8.0mm Drill Bushing will slide freely in the Targeting Arm. Make small incisions in the soft tissue and through the iliotibial band, down to the lateral cortex of the femur. Be certain that the bushings are firmly seated on the bone. Do not force the bushings or impact. Insert a 3.2mm Threaded Guide Pin into the inferior set of bushings. Drill the Guide Pin to the level of the subchondral bone of the femoral head, without penetrating the femoral head cortex(Fig.25). Insert a Guide Pin into the superior set of bushings. 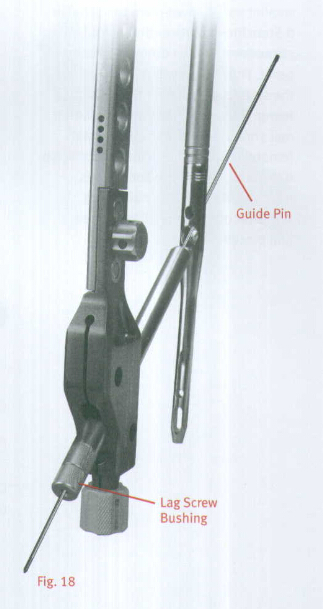 The Screw Inserter Adapter may be used with this Guide Pin to prevent impingement on the adjacent Guide Pin during insertion (Fig.26). Drill the Guide Pin to the level of the subchondral bone of the femoral head, without penetrating the femoral head cortex. Assess the position of the Guide Pins using C-arm in the A/P and lateral planes. 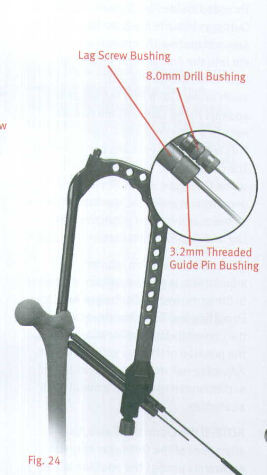 NOTE: Ideally each Guide Pin should be situated well inside the femoral neck to allow adequate room for screw placement without contacting the cortical wall, If there is not sufficient cortical wall surrounding the Guide Pins on examination with the C-arm, the nail may be repositioned and implanted using only the Lag Screw. Remove the Lag Screw Pin Bushing. 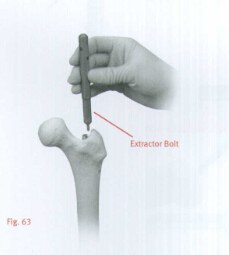 Slide the Cannulated Depth Gauge over the lag screw Guide Pin,(i. e. the inferior of the two guide pins), until the gauge contacts the lateral aspect of the femur(Fig.27).Assess that the Gauge is seated against the bone using the C-arm. Read and record the length of the guide pin from the calibrated depth gauge. NOTE: This measurement designates the correct length of the Lag Screw to be implanted(Fig.28). 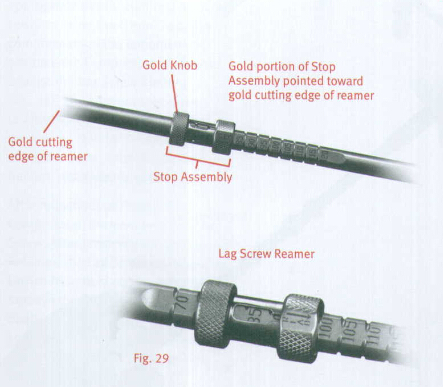 Slide the Stop Assembly onto the ITST Lag Screw Reamer, keeping the gold portion of the Stop Assembly toward the cutting end of the reamer(Fig.29).Move the Stop Assembly along the incremented lengths listed on the reamer. Align the threaded end of the Stop Assembly with the notch denoting the appropriate length. When the Stop Assembly is fully seated, the arrow on the Stop Assembly will indicate the appropriate depth level. This"length"corresponds to the measurement obtained from the guide pin(Fig.30). Place the ITST Lag Screw Reamer over the Guide Pin and seat it against the femoral cortex. 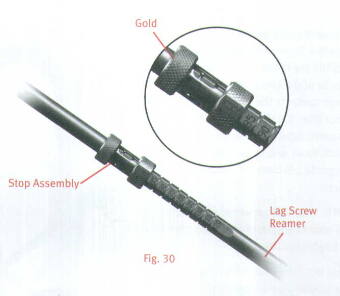 Under power, advance the reamer until the Stop Assembly stops against the Lag Screw Bushing(Fig.31).Monitor progress of the reamer using the C-arm. Remove the reamer. (If necessary), assemble the Lag Screw Tap by locking the Stop Assembly at the level of the apporpriate measurement, in the same fashion as the Lag Screw Reamer. Place the Lag Screw Tap over the Guide Pin and through the Lag Screw Bushing. Advance the tap until the Stop Assembly stops against the collar of the Lag Screw Bushing(Fig.32).Confirm Tap position with the C-arm. If not using the ITST Compression Device, proceed to page 16. Thread the Compressor onto the Lag Screw Compression Device T-Handle. Insert Compression Retainer through the Lag Screw Compression Device T-Handle(Fig.33)and thread into the appropriate Lag Screw until it is securely fastened to the Lag Screw Compression Device T-Handle. 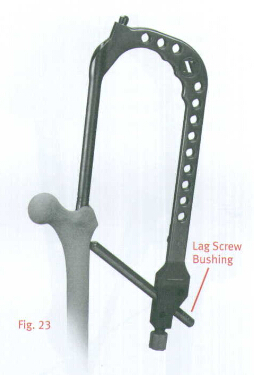 Pass the Lag Screw compression Device assembly through the Lag Screw Bushing and over the Guide Pin (Fig.34).Thread Lag Screw to within 5mm of the subchondral bone, monitoring the Lag Screw advancement with the C-arm. 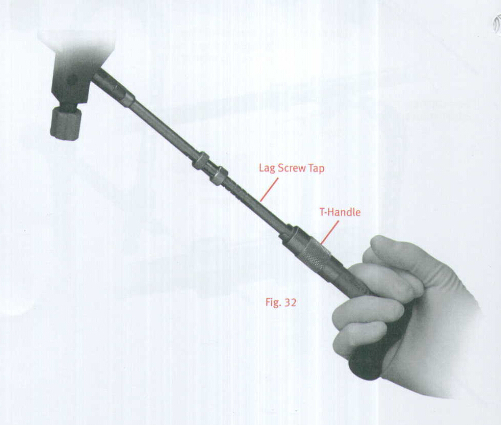 If planning to use a Nail Cap which prevents rotation or limits sliding, rotate the Lag Screw Compression Device T-Handle(Fig.35).such that one of the four etched lines is in line with the vertical slot on the Targeting Guide. After inserting the Lag Screw to the appropriate depth, confirm Lag Screw position using the C-arm.To begin compression of the C-arm. To begin compression of the femoral neck, advance the Compressor clockwise against the Lag Screw Bushing (Fig.36). 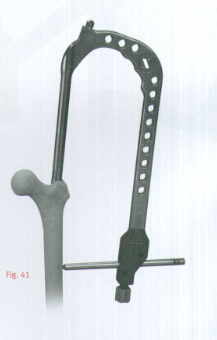 The surgeon continues to advance the Compressor while monitoring femoral neck compression using the C-arm, until the desired fracture reduction is achieved. After reduction, unthread the Compression Retainer from the Lag Screw. After removing the compression Retainer, the Lag Screw Compression Device Assembly can be removed. Remove the Superior Guide Pin and Bushings if used. If using ITST Global Long Nail, remove Targeting Guide using the Pin Wrench and Locking Bolt Extractor. 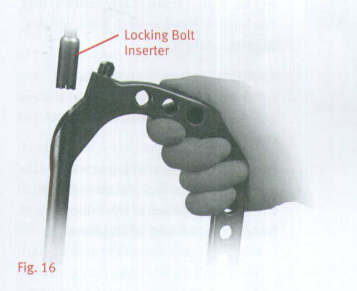 Thread the Inserter Link (Fig.37)into the Lag Screw until securely fastened. Slide the Lag Screw Inserter Shaft over the Inserter Link(Fig.38). Insert this assembly over the Guide Pin. Thread the Lag Screw to within 5mm of the Subchondral bone. Rotate the Inserter Shaft (Fig.39)and align one of the four etch lines on the Inserter Shaft with the vertical slot on the Targeting Guide(Fig.48).Check the Lag Screw position using the C-arm. Leave the Inserter Link attached to the Lag Screw. Remove the 3.2mm Pin Bushing. Slide the Cannulated Depth Gauge over the Guide Pin, until the Gauge contacts the lateral aspect of the femur. Confirm the position of the Depth Gauge using the C-arm. Read the depth of the guide pin from the Cannulated Depth Gauge. The Anti-Rotation Screw length should be 15mm to 20mm shorter than the depth gauge measurement.This will provide the proper screw placement to help minimize femoral neck cutout2(Fig.40). Remove the Guide Pin. Under C-arm control, drill into the femur with the 5.0mm Drill until the correct calibration on the drill is level with the outer collar of the Drill Bushing. Remove the 5.0mm Drill Bushing and Drill. Insert the Anti-Rotation Screw using the 5.0mm T-Handle Screwdriver through the 8mm Screw Bushing and into the femoral head until seated. Placement of the screw should be monitored using the C-arm. With the Proximal Targeting Guide still in place, retighten the Locking Bolt if necessary. Assemble the appropriate Drill Bushing(see Table 1)into the 8.0mm Screw Bushing, and place the nested bushings through one of the distal targeting holes in the ITST Modular Targeting Guide(Fig.41).Make a small incision through the skin and fascia lata. Spread the soft tissue down to the bone. Advance the bushing until it contacts the lateral femoral cortex. Advance the appropriate size Drill through the bushings until both cortices of bone have been penetrated. NOTE: If using the Calibrated 3.7mm or 5.0mm Drill, read calibrations from end of bushing to determine screw length. Remove the Drill and Drill Bushing, and insert the ITST Screw Depth Gauge through the 8.0mm Screw Bushing until the gauge captures the far cortex of bone(Fig. 42, 43). Read the measurement for the screw from the end of the depth gauge. NOTE: Choose a screw length that is at least 2.5mm longer than the depth measured, to ensure that bicortical screw fixation is attined. 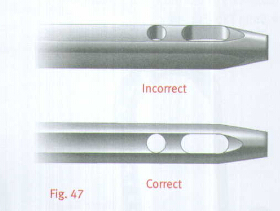 If the bone quality is good, it may be necessary to tap the channel using the 4.5mm Tap(Fig.44). 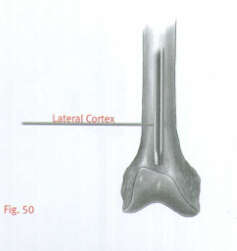 Place the appropriate length Cortical Screw onto the 3.5mm T-Handle Hex Screwdriver and insert the screw into the bone through the 8.0mm Screw Bushing, until it is flush against the lateral cortex of the femur (Fig.45).Confirm the position of the screw in the A/P and lateral views with the C-arm. Place the second distal locking screw in the same fashion as the first. 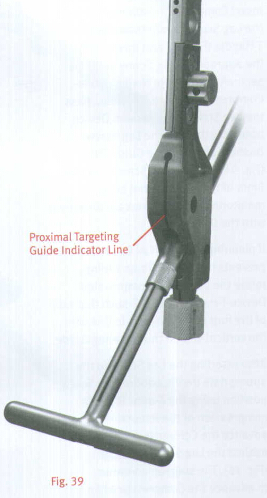 The distal locking screws may be inserted with a freehand technique using the Freehand Targeting Device (Fig.46). Insert a 3.7mm Drill (Color Code: Blue)for a 4.5mm screw, or insert a 5.0 mm Drill(Color Code: Green)for 5.5mm screw into the Freehand Targeting Device. Finger tighten the set screw. Choose the appropriate locking hole based on the need for dynamization. The superior locking hole on the ITST Nail is used for static locking, while the distal locking hole is used for dynamic locking. If static locking is preferred, but there is a potential need for later dynamization, insert screws in both locking holes. The locking screw in the static hole can then be removed to achieve dynamization later. For success with this technique, proper placement of the lateral X-ray beam is critical. 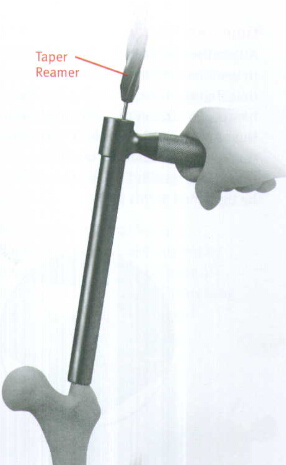 Position the C-arm so that the locking hole of the nail appears perfectly round on the monitor(Fig.47＆48). 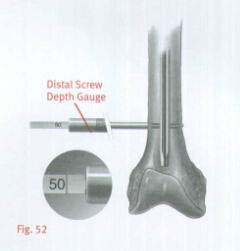 Remove the Drill and insert the Distal Screw Depth Gauge(Fig.52).The length of the screw is determined by reading it directly off the Distal Screw Depth Gauge. 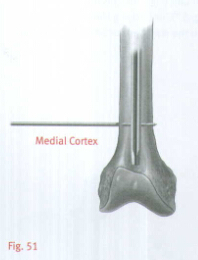 NOTE: Select an appropriate length screw to ensure adequate engagement of the medial cortex. 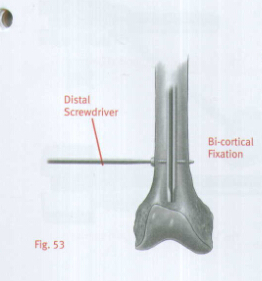 Insert the appropriate size M/DN®Screw using the Distal Screwdriver (Fig.53). If desired, insert the second screw in the second locking hole of the nail in an identical manner. 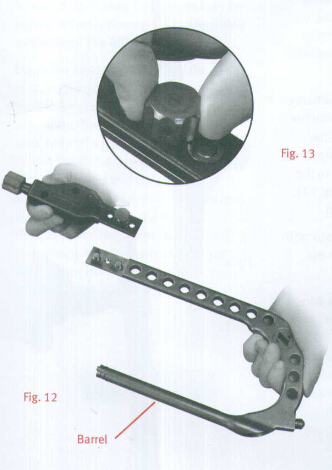 Check the position of both screws with the C-arm in the A/P and lateral planes(Fig.54). Bushings are available that can be used with the Freehand Targeting Device. A separate radiolucent Bushing Insert is available to aid in targeting. Remove the ITST barrel Targeting Arm, Threaded Driver and Locking Bolt using the Locking Bolt Extractor(Fig.55).Take care to leave the Lag Screw Inserter Link in place for final Nail Cap seating. Insert the appropriate Nail Cap: Neutral Nail Cap(Fig.56). Sliding Nail Cap(Fig.57).or Locking Nail Cap(Fig.58)with the Nail Cap Inserter(Fig.59,60). Tighten until fully seated. If using a Sliding or Locking Cap, slide the Lag Screw Inserter Shaft over the Insert Link and into the Lag Screw (Fig.59). Slowly rotate the Lag Screw Inserter and Nail Cap Inserter until the Nail Cap flange can be felt seating into one of the four lag screw shaft grooves(Fig.60). Close the proximal wound and apply a soft compression dressing. Postoperative range of motion exercises and weight bearing should be individually determined by the surgeon based on patient age, fracture pattern, and surgeon evaluation. In order to extract the nail, remove any existing distal screws with the 3.5mm T-Handle Hex Screwdriver. Remove the Nail Cap with the 5.0mm T-Handle Screwdriver. Make a small incision in the area of the existing proximal incision to expose the ends of the Lag Screw and Anti-Rotation Screw. Clear any bony ingrowth away from the Lag Screw hex, and thread the Retaining Shaft into the Lag Screw. Slide the Lag Screw Inserter into the Lag Screw, and tighten the Extraction knob. Remove the lag screw, turning counter clockwise, with a slight backward pulling motion(Fig.62). Once the Lag Screw has been removed, use the 5.0mm T-Handled Hexdriver to remove the Anti-Rotation Screw. Attach the Extractor Bolt into the nail (Fig.63).Screw the Slaphammer onto the Extractor Bolt and remove the nail.